2o degrees F outside; I sat curled up on the couch wishing the genie would bring me a warm bowl of soup. Wishes often do not come true, so I had to push myself up to go make the warm bowl of soup. No one other than me appreciates mushroom in my home. Why?!! I don’t know. Good for me for I do not have to share it with any one 😉 I love my mushrooms. Here is the soup I came up with, no recipe followed. I think the taste was much enhanced with the use of the Spicy Sesame Oil. (If you are using the roasted garlic, mash it and set aside). Heat 1 tablespoon of oil; fry the garlic till golden. Add the sliced mushrooms to the same pan; fry them at high heat along with the garlic till they are roasted light brown. Remove them from the pan, and set aside. Separate some of the roasted/fried mushrooms for adding them to the soup later for a chunky texture or for garnish. In the same pan add the the rest of the oil, and the onions and cook them at medium heat till they are clear and softened. Add the thyme, salt and black pepper, crushed red pepper to the pan with the onions. Cook them at medium heat for about 5 minutes. Sprinkle the flour and stir it in the above mix. Add half of the milk and simmer for about 2-3 minutes at low heat. Add the mushrooms (other than the part that was set separate for later) and the mashed roasted garlic, if you are using and cook everything together for 3-4 minutes. Switch off the heat and carefully blend the in ingredients in the pan with an immersion blender, or transfer everything to a blender and blend till it is pureed. (I left mine slightly coarse; as I like the texture that way). If you want it creamy, make a smooth and creamy blend. Return to the pan, add rest of the milk, water and the rest of the mushrooms. Simmer at low for about 10 more minutes. Remove from heat and squirt a teensy bit of lemon juice. Ladle into individual bowls. Generously drizzle the Spicy Oil on the soup. Serve warm garnished with Crushed Pepper, Scallions and Thyme. Earthy, peppery, meaty and creamy ; a big burst of taste and flavor. 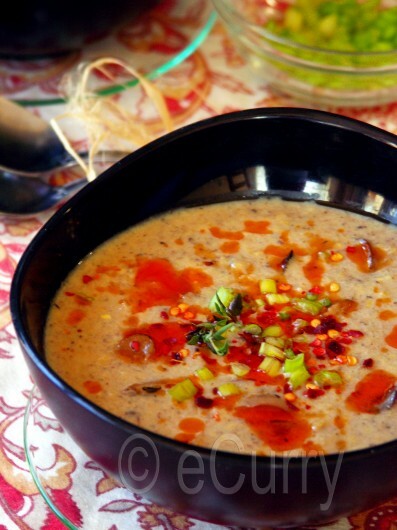 Any time you make a mushroom soup, do not forget to use your herbs and some spicy oil. A perfect dinner soup for chilly nights. Enjoy! The Soup is being sent over to Meeta’s Monthly Mingle:Soup, hosted by Sunshinemom of TongueTicklers. Wowo one whole garlic roasted. Looks very tempting and delicious….nothing matters than a hot bowl of soup in this cold winter..
Don’t blame you if you do not want to share that soup. It looks wonderful. I am not a big fan of creamy soups. I like those clear ones. Hehe I wish also If the genie could bring one of ur bowl to me Soma! Like the idea of hot chile oil in soup! I love mushrooms too, and this sounds incredible with the chile oil. Beautiful soup! that is one beautiful soup! So appetizing! looks yum, love the garnish very much. Love the addition of garlic n sesame oil. nice photos! that bowl of soup is gorgeous! Garlic and mushroom are some of my favorite ingredients!!!! !That soup looks fantastic, Soma! Great idea adding roasted garlic and chili! Perfect in this cold weather. I love those bright sunny photos Soma. And that soup just sounds perfect! Wow, I can just smell the intoxicating aroma of garlic while reading your post. I often wish that a nice piping hot bowl of soup would appear before me on cold rainy nights like tonight. 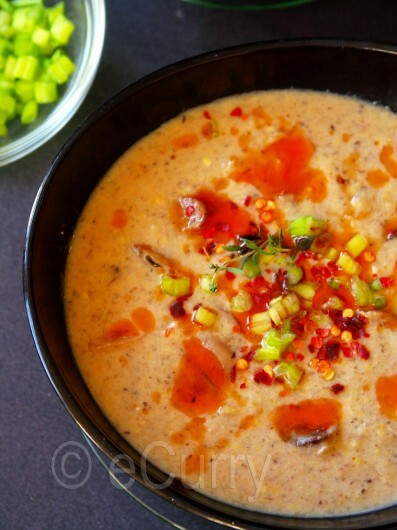 This flavorful soup would warm up any chilly evening! Wow, that soup sounds so flavourful and delicious. Lovely bowl of soup….me & he both love mushrooms but when it comes to mushroom soup, same story….me loves it he doesn’t…..
Mushrooms and garlic, what’s not to love? 🙂 I love the way you present your soups and salads Soma… These pics make me want to have a bowl right away. Who would have known mushroom soup could look so fantastic. My goodness…. how have you been darling? Looks great Soma, I will try this out soon. Thats a very new variety of soup for me,sounds good! Oh my, what a wonderful soup! We were bone-chilling cold last week, but it is just about zero now so not so bad. This soup would be perfect to keep you warm. Fragrant, creamy, and spicy! Love it, Soma. I am mad for mushrooms. 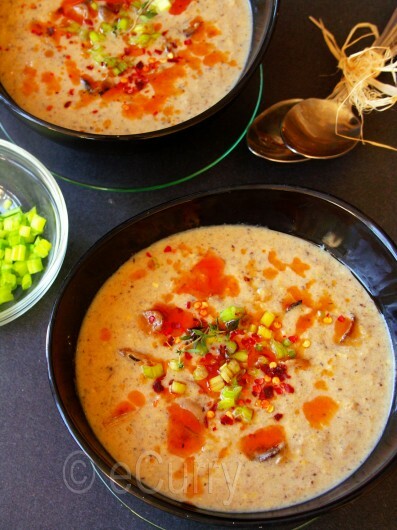 The more garlic the merrier Soma…love your take on mushroom soup! 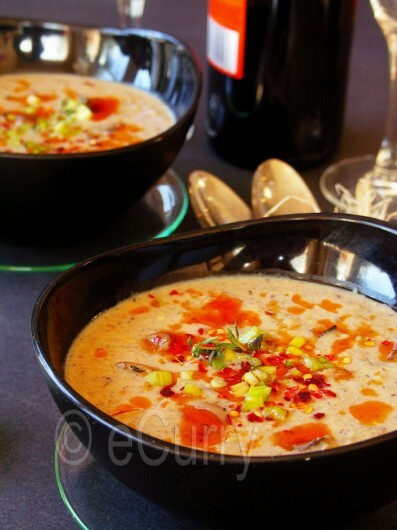 Every one in my family love mushroom … so this soup just perfect for us.. I love garlic in my cooking, the more the better. I will have to try this soup thanks. This soup look so pretty! I saw it and knew that I definitely needed to make it for my family. I love Soup Recipes and my family jokes that if they would leave me to my own devices I would cook soup every night forever. And to be honest its not that much of an exaggeration because I really love soup. I work with Better Recipes so I am always reviewing recipes which is great because I can set aside the really good soup recipes. This soup in particular was just delicious and I will be making it again!